Youngstown Steel Heritage Foundation hasn't added a story. Extra 3639 North is a project of the Youngstown Steel Heritage Foundation to acquire, move and restore former Erie Lackawanna SDP45 No. 3639 (Conrail 6670). Our goal is to move it to the Marter Yard Railroad Museum in Youngstown, OH where it will be exhibited as part of the collection of regionally significant rail equipment. Youngstown was the heart of the Erie Lackawanna Railroad and the steel mills in the area were the single greatest source of online revenue for the railroad. We have made a deal with the Virginia Museum of Transportation to purchase the 6670 for $15,000. We are raising an initial $20,000 to pay for the purchase as well as fund some initial repairs to the locomotive. Fundraising will continue in 2019 to fund the cost to move the locomotive north on Norfolk Southern to Youngstown. Initially the locomotive will retain its identity as Conrail 6670, but at some point in the future it will be repainted into the as delivered Erie Lackawanna scheme. This is being done because it is easier to simply repaint it blue now with a minimal amount of work, whereas the EL scheme is quite detailed and when we do it we want to "get it right"! The locomotive is missing a few major components, however we do have plans to eventually restore the locomotive to operational condition. What use might we have for this locomotive? That remains to be seen but opportunities may arise in the future if the locomotive is operational and Blue Carded. While the locomotive is 49 years old it only had 15 years of use, from 1969 to 1984, so it is certainly not worn out. Please consider supporting this effort. This is probably the only real chance that the locomotive will have to meet a fate other than scrap, so let's make it happen! 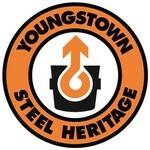 Youngstown Steel Heritage Foundation hasn't posted any updates yet.